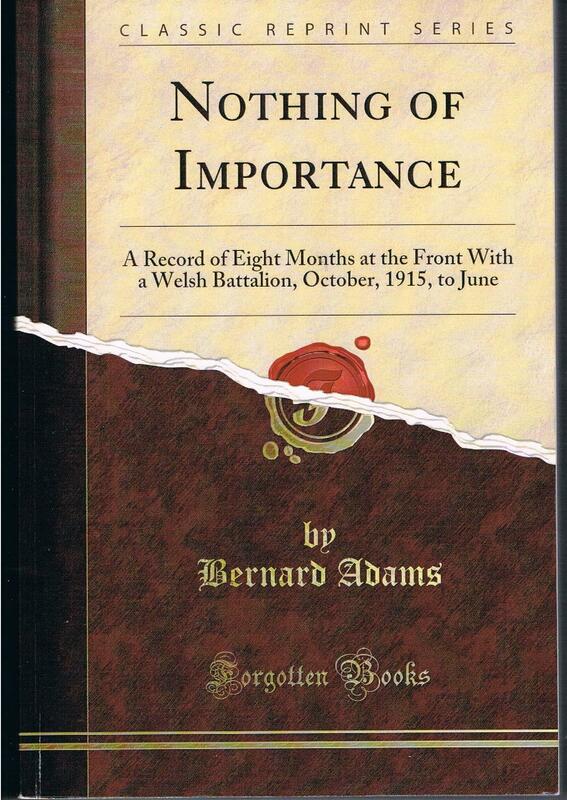 I have just finished reading a wonderful book titled ‘NOTHING OF IMPORTANCE: A Record of Eight Months at the Front With a Welsh Battalion, October, 1915, to June 1916,’ by Bernard Adams (part of the Classic Reprint Series -Forgotten Books – originally published in 1917). The book, a personal memoir written by Adams while on convalescent leave after being wounded on the Western Front during the Great War in 1916, was given to me as a Christmas present by my son. The book is a truthful record of Adams’ service in the Royal Welsh Fusiliers, at times it is quite graphic but never pretentious or attempting to glorify the war, rather it is an almost day by day account of his service in the trenches moving from his sense of forthcoming adventure to his attempts at trying to understand what he was seeing and what he was part of, and what war is, his sense of compassion and loss at the deaths of his men and of his close friends is very moving. He tries to show the reader what the experience was, provided drawings of trench layouts and maps with vivid descriptions of the peaceful French countryside in comparison to his fears and the destruction in the front line. Even now almost a hundred years later his words speak profoundly. I think that this is most likely the best memoir I have read of the First World War. Adams was the first of three very remarkable authors who served simultaneously in the Royal Welsh Fusiliers. The second to join was the poet Siegfried Sassoon and a few days later the poet Robert Graves. Although he is now relatively forgotten – Adams was the first of the three to publish his memoirs of service with the RWF in the war. Thanks to his sister, although he did not live to see it, Adams’ memoir was the only record to be published whilst the war was still being fought, he was killed in action less than a month after returning to the front in February 1917. My original interest in Adams memoir was the fact that Siegfried Sassoon had kept a personal copy with him while in England after his return from his first tour in the trenches. He had annotated the inside cover with a list of all the officers of the Royal Welsh Fusiliers who had initially sailed to France at the opening of the war and those who had replaced them (including Adams). The list also recorded the dates these officers, many of them his friends, became casualties. Upset at the news that his friend and fellow poet Wilfred Owen, who he had met in Craiglockhart Military Hospital in Scotland, had received word that he would soon be returning to France, Sassoon gifted him his annotated copy of ‘NOTHING OF IMPORTANCE,’ the irony of the title most likely not being lost on both men. Sassoon survived the war, his friend Wilfred Owen was killed in action almost a week to the day before the ending of the fighting in November 1918. 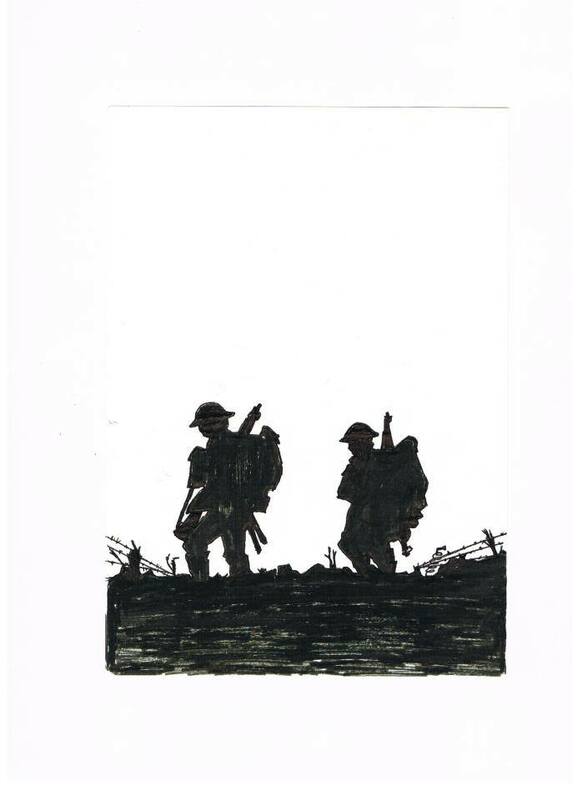 Owen is regarded as the greatest of the war poets and the book, which Sassoon gave to him, still survives as part of his collection in UK archives. The BOOK, in my humble opinion, is very IMPORTANT!